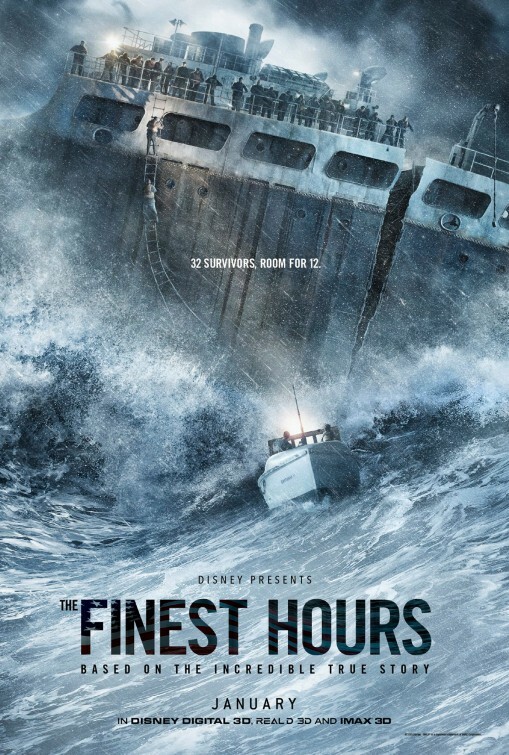 “The Finest Hours” feels like a “based on a true story” disaster movie from the 90s, but it’s more like the maritime dramas from long ago. Although it’s set in the 1950s and there’s a resemblance to sea tragedy movies like “The Perfect Storm” and “Titanic”, it relies more on human drama than the visual effects of those blockbusters. The movie, directed by Australian Craig Gillespie (known for the “Fright Night” remake and “Lars and the Real Girl”) is a continuation of his working relationship with Walt Disney studios after he helmed 2014’s “Million Dollar Arm”. With Ron Howard’s true story-at-sea disaster “In the Heart of the Sea” sinking at the box office recently, the appeal for such movies in this subgenre seem to be lost at the multiplex. Nevertheless, moviegoers always like a good rescue mission (free of cannibalism and starvation, that is), especially ones that cheer and/or salute men of service who bravely risk their lives in the face of certain doom. That’s what happens here as we follow a four-man crew aboard the Coast Guard 36 ft. Motor Lifeboat CG-36500, consisting of by-the-book Boatswains Mate First Class Bernard “Bernie” Webber (Chris Pine), Engineman Third Class Andrew “Fitz” Fitzgerald (Kyle Gallner), Seaman Ervin Maske (John Magaro), and Seaman Richard P. Livsey (Ben Foster), who heroically responded to assist two crippled commercial tankers – SS Fort Mercer and SS Pendleton – near Massachusetts on the evening of February 18th, 1952. 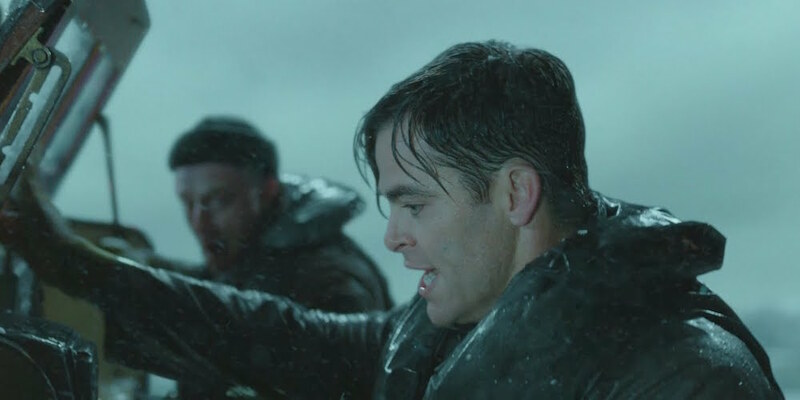 In real life, they were assisted by the crew of Coast Guard cutter USCGC Yakutat, a ship which was in tactical command of rescue efforts, but “The Finest Hours” focuses solely on Bernie and his motorboat maneuvering challenging waters and the stern of the Pendleton that is left spiraling off the coast of Chatham, Massachusetts. 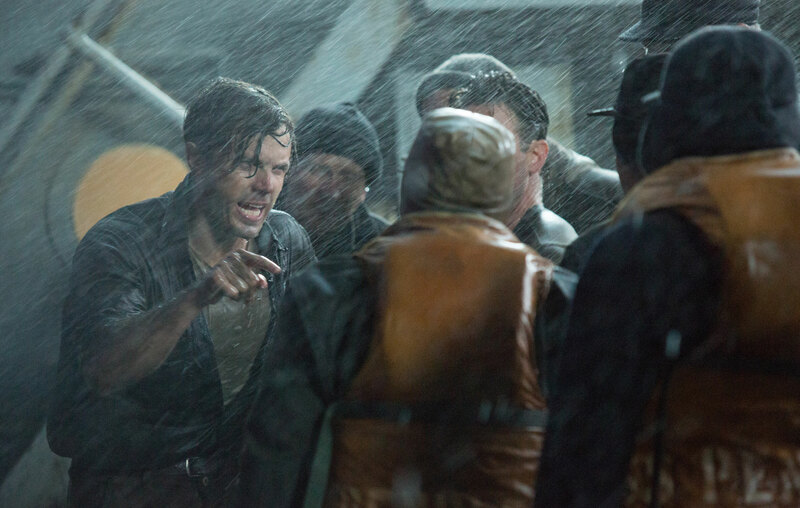 The Pendleton’s assistant engineer, Ray Sybert (Casey Affleck, an understated standout), has to not only contend with the storm and a half-sunken ship, but a contentious crew. None of the survivors are crazy about suddenly being led by a scrawny nerd who’s knows more than they do. Eventually, his crew – including the affable giant ship’s cook, named Tiny – of course (Abraham Benrubi “Open Range”), a brawny Scotsman, Frank “Pops” Fauteux (Graham McTavish, “Creed”) and insubordinate rotten egg, A.B. Seaman D.A. Brown (Michael Raymond James of “True Blood”) – has to come around to his leadership when they realize that imminent death is at every turn and Ray is the only who can figure out ways to keep them alive. It’s both surprising and interesting to see a movie that you expect to rely so heavily on FX an stereotypes, delve into the friction that develops during such perilous situations as well as offer believably earnest characters. 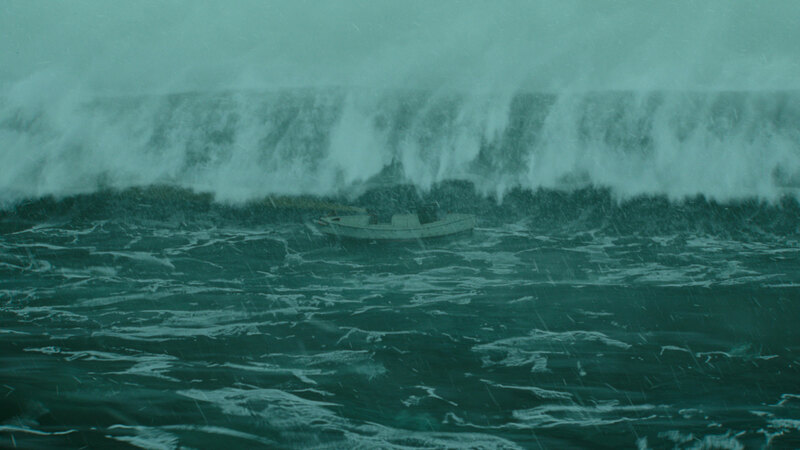 The tone of “The Finest Hours” never puffs up bravado, but rather focuses on the pure-hearted courage of scared men trying to do what’s right. Gillespie’s best work here is when he’s at sea, since the saccharine dialogue and undercooked subplot involving Bernie’s girlfriend, Miriam (Holliday Grainger) feels like a trope that is being crossed off a checklist. When the focus is on the crippled tanker and the little motorboat, both victims of a tumultuous storm, the melodrama on the shore is drowned out and almost feels unnecessary. Even when Miriam confronts Bernie’s direct report, Chief Warrant Officer Daniel Cluff (Eric Bana, wrestling a Southern drawl amid all the Bahston accents) and requests (over and over again) he call Bernie and his boys back home, it gets to be a bit much and we eagerly await a cut back to the storm and the waves. 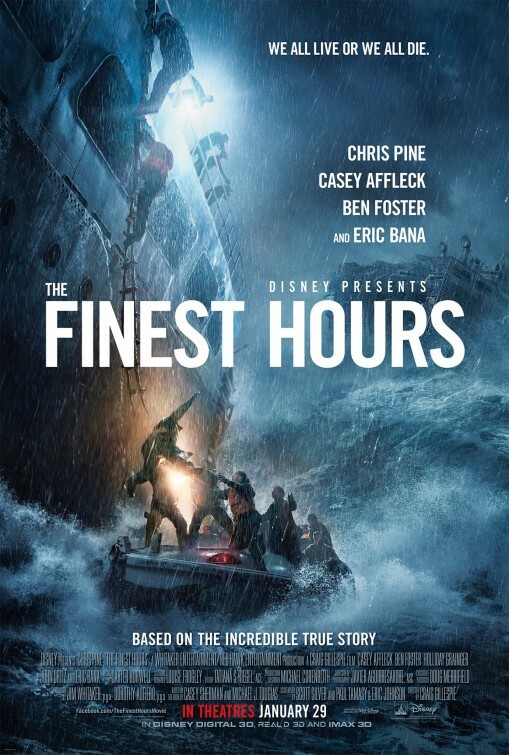 The three screenwriters here, Scott Silver, Paul Tamasy and Eric Johnson – have adapted the novel, The Finest Hours: The True Story of the U.S. Coast Guard’s Most Daring Sea Rescue by Casey Sherman & Michael J. Tougias – and it truly is a harrowing and incredible true-life tale. The writers treat each obstacle Bernie and Ray encounter like a thread in a nail-biting procedural. There was only room for a total of about twelve people on Bernie’s CG-36500, but he was determined to fit as many of the Pendleton’s survivors as he could. In doing so, he wound up saving thirty-four lives and made it back to shore without a compass, guided by the light of a line of automobile headlights started by Miriam (who knows if that part was actually true, but it certainly makes a sweet Hollywood ending). 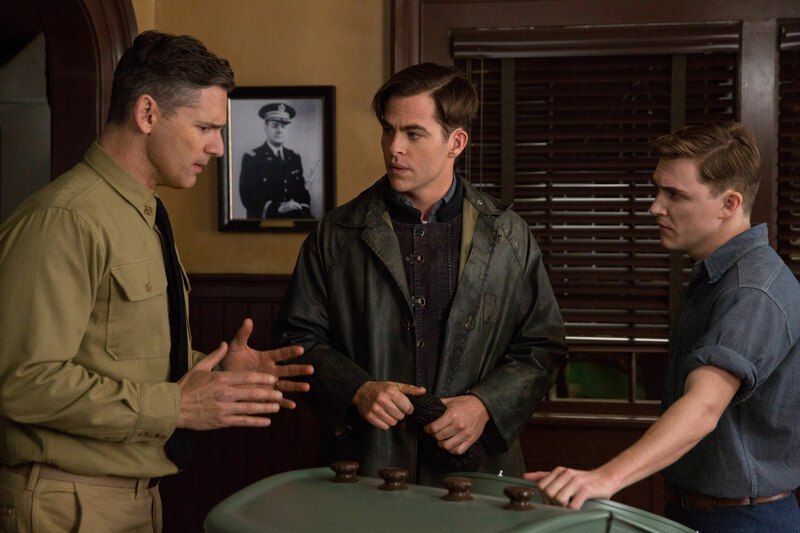 Sure, “The Finest Hours” may be predictable, but it earns its suspense and emotions genuinely – and for once, this is an inspiring disaster/survival story that can be viewed by the whole family. I don’t even recall an utterance of profanity – that’s how old school this feels and I welcome it when you consider that all there is in theaters for families is derivative animated fare. As usual, you really don’t have to see this movie in 3D, it just makes everything darker – and considering the fact that most of this movie takes place at night with a dark color palette, that doesn’t help the viewing experience.